Nowadays, Hiko-ho-Ni-nigi-no-mikoto; Heaven's-Sun-Height-Prince-Rice-ear-Ruddy-Plenty, is said to be a legendary person, but in fact he was a real figure who invaded Chikushi*1 from Ama-kuni*2 in the Middle First Yayoi period (200 B.C.). Ni-nigi was a leader of the Marine Army in Ama-kuni. Ni-nigi attacked Hinomoto people lived in Itazuke Site, and ruled the presentday Fukuoka and Maebaru. Hinomoto people fought a fair battle, but defeated. Some of them fled from Chikushi, and went to Tsugaru (Aomori). Ni-nigi was a aggressor and the Prime-Deity-King of Kyushu Dynasty (i.e. Wa-states) . This event is called "Descent from Heaven" in the record of "THE KOJIKI( Records of Ancient Matters)". Ni-nigi descended from "Heaven" onto the peak of Mt. Kuzhifuru in Takasu (Takachiho) in Chikushi. The place is opposite to the "Land of Kara". In fact, a view of Korea from Takachiho is very good on a clear day. "Kara" is an old name of South Korea. 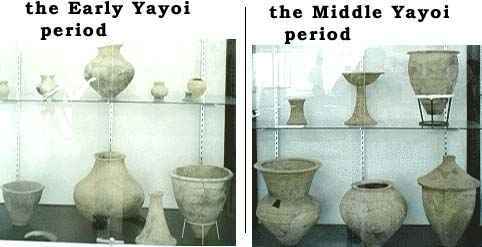 I suppose that the event "Descent from Heaven" separates Last Early from First Middle Yayoi period, and causes radical change of archaeological implements in Early and Middle Yayoi period (200 B.C.). These samples below give the evidences. Hinomoto lately corrupted to Nihon, and from 700A.D. Yamato Dynasty adopted it for the official name of their nation*3. *1)Chikushi is an old name for the Hakata Bay Area. Tsukushi is the same name. *2) A central area of Ama-kuni is Iki-island and Tsushima-island. *3) For example there are two states, Wa-koku and Nihon described in Old T'ang History. The conventional opinions are as follows. So then [the Heaven-Shining-Great-August-Diety and the High-Integrating-Deity] commanded His Augustness Heaven's-Prince-Rice-ear-Ruddy-Plenty; and he, leaving the Heavenly Rock-Seat, pushing asunder the eight-hold heavenly spreading clouds, and dividing a road with a mighty road-dividing, set off floating shut up in the Floating Bridge of Heaven, and descended from Heaven onto the peak of Kuzhifuru which is Takachiho in Tsukushi. Thereupon he said ; "This place is opposite to the Land of Kara." One comes straight across to the august Cape of Kasasa; and it is a land whereon the morning sun shines straight, a land which the evening sun's sunlight illuminates. So this place is an exceedingly good place. Having this spoken, he made stout the temple-pillars on the nethermost rock bottom, and made high the cross-beams to the Plain of High Heaven, and dwelt there. 34 burial jar graves and 4 wooden coffin graves discovered at this site in 1981. 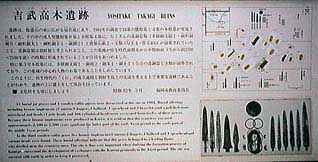 Burial offerings including (1 mirror, 9 daggers, 1 halberd, 1 spearhead and 2 bracelets), and a polished stone arrowhead and (4 jade beads and 466 cylindrical beads) were excavated from twelve of these graves. Because these bronze implements were produced in Korea, it is evident that this century was used approximately 2,100 to 2,200 years ago (from the latter part of the Yayoi period to the early part of the middle Yayoi period). In the third wooden coffin grave five bronze implements (1 mirror, 2 daggers, 1 halberd and 1 spearhead) and various beads were found. These burial offering indicate that this grave belonged to a leading figure who dwelled near cemetery area. This site is thus very important when studying the formation process of Kuni(provinces) and the development of exchanges with the Korean peninsula in the Yayoi period. This site was covered with earth in order to keep it preserved. This is where the remain of a large size building existed in the middle of Yayoi Period. It was discovered during the 6th survey of the ruins group in February 1985. The ruins of the building was at the shorter end from east to west, four spans between columns 9.6 meters wide and the longer end from north to south, five spans between 12.6 meters wide. Around the four sides there was something like a veranda surrounding the building with five spans between the columns. The floor space was more than 120 square meters which is considered to be the ruins of an oldest and largest building in our country. The sketch on the right shows the building restored as a raised floor building, but is may have been a surface dwelling type building. 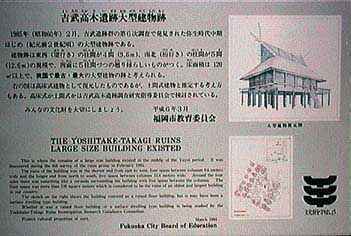 Whether it was a raised floor building or a surface dwelling type building is being studied by the Yoshitake-Takagi Ruins Investigation Research Guidance Committee. Protect cultural properties of ours. We accept any opinion concerning with this, please send E-mail to Yukio Yokota. Created & Maintenance by " Yukio Yokota"